Indigo is adding two pre-owned A320s to the fleet, as VT-IHK & VT-IHL. In a move aimed at giving it an edge over its competition, India’s largest carrier IndiGo is set to upgrade a part of its existing order for 250 A320neos to A321LRs, industry sources said. The move will enable the carrier to increase the number of seats per flight and also deploy the aircraft on short overseas routes. “Whenever an airline places an order with the manufacturer, there is an option for an upgrade of the equipment. IndiGo has exercised that option for A321LRs,” said an industry source. It is believed that the number of aircraft the airline seeks to upgrade at this point is between 20 and 25. The aircraft are likely to be inducted into the fleet in fiscal 2019-20. “The manufacturer needs to be informed about the upgrade well in advance, may be 12-13 months,” said an airline executive, not wishing to be named. The delivery period may also depend on the delivery schedule for this aircraft type, as it is a new model with large orders placed by international carriers. IndiGo grounded three Airbus 320 neo (new engine option) aircraft on Friday after the European aviation regulator issued an emergency directive raising concerns over a potential "dual engine" failure in such aircraft that are fitted with a certain category of Pratt and Whitney engines. .
A320 neos, made by European aircraft manufacturer Airbus and powered by American aerospace manufacturer Pratt and Whitney's (PW) turbofan engines, have been having engine problems since the time they were inducted into global airline fleet two years ago. Following the European Aviation Safety Agency's (EASA) order, Airbus announced that it has stopped delivering A320 neo jets fitted with PW 1100 engines. IndiGo is the largest operator of twin-engined A320 neo aircraft in the world; all their 32 neos are fitted with PW 1100 engines. IndiGo A320 neos have had the most failures globally: a total of 69 instances of single-engine failure in the 18 months between March 2016 and September 2017. The Indian regulator, Directorate General of Civil Aviation (DGCA), which accepted the order, did not ground the entire A320 neo fleet. The European Aviation Safety Agency warning is only for a particular "subpopulation" or sub-category of engines within this faulty engine group. The EASA warning was necessitated by several occurrences of engine in-flight shut-down and rejected takeoff involving A320 neo family aeroplanes, said a top DGCA official. The EASA warning was necessitated by several occurrences of engine in-flight shut-down and rejected take-off involving A320neo family aeroplanes, said a top DGCA official. "While investigation is on to determine the root cause, EASA's preliminary findings indicated the particular subcategory of PW1100 engines was more susceptible to dual engine failure," he added. Airbus has also issued an alert to operators of A320neos, providing instructions to de-pair the affected engines and discontinue operations over routes where the closest runway is more than an hour away. The DGCA official stressed the above issue is entirely different from issues of bearing failure and combustion chamber failure experienced initially by PW1100 engines, which, he said, have been addressed. IndiGo's instances of single-engine failure in 18 months averaged one a week. However, if one engine fails, a twin-engine aircraft like an A320 can safely land with the other operative engine. Yet what was brow-raising was the unprecedented frequency with which these engine failures occurred, a world record, said aviation experts. According to a media report, Airbus said there are only 43 engines worldwide of this sub-category. How many of them are with IndiGo is not known. IndiGo did not go into the question. "Airbus and Pratt are working in close cooperation and will be swiftly communicating on the way forward to regain normal operations and resume aircraft deliveries," said the IndiGo statement. The tussle over IndiGo shifting one-third domestic flights from Delhi Airport’s Terminal 1 to Terminal 2 shows no sign of ending. IndiGo has now moved the Supreme Court on this issue, after the Delhi high court earlier this week dismissed its appeal against Delhi International Airport Pvt Ltd (DIAL)’s decision of shifting some domestic flights of low cost carriers from T1 to T2. “Yes, we have filed a special leave petition in the Supreme Court on matter related to shifting to Terminal 2 at Delhi Airport,” said an IndiGo spokesman. The matter is likely to be heard next week. DIAL wants to move one-third of flights out of T1 to decongest the terminal and then begin its expansion work. While GoAir (which does not fly international) has already shifted all its domestic flights to T2 at IGI Airport, SpiceJet and IndiGo are yet to move some domestic flights from T1. This issue has been hanging fire for over a year now and has delayed the expansion of T1, which is handling much more traffic than its built capacity. SpiceJet has made it clear will shift some flights if IndiGo does the same. “IndiGo can’t say that it is either their way, or the runway,” a bench of Delhi HC justices Hima Kohli and Rekha Palli had said earlier this week dismissing IndiGo’s appeal against the partial shifting. The bench had given a week’s time to the airline to suggest to DIAL, sectors other than Delhi-Mumbai, Bengaluru or Kolkata that it is willing to shift from T1 to T2, as long as they collectively meet the yardstick of one-third passenger traffic volumes of their operations at Terminal 1. “In the event such a request is received by the DIAL within the stipulated timeline, the same shall be considered and a decision taken under written intimation to both the airlines within one week from the date of receipt,” HC had said. Now with the matter going right up to the apex court, the issue may finally see a closure. Indigo has added a new ATR72-600 to the fleet today, as VT-IYD. The Supreme Court on Friday disposed of a plea of no-frill carrier IndiGo challenging a Delhi high court order to shift its operations partially from Terminal-1 (T-1) of the IGI Airport here to Terminal 2. A bench of Chief Justice Dipak Misra and Justice D Y Chandrachud refused to interfere with the high court's February 13 order by which it had directed the airline to shift its operations partially to T2 but granted some relief by extending the timeline to approach Delhi International Airport Ltd's (DIAL). The High Court had granted a week to IndiGo and SpiceJet to approach DIAL for suggesting flights to and from sectors that they would be ready and willing to shift from T-1 to T-2, as long as they collectively meet the yardstick of one-third passenger traffic volumes of their operations at T-1. "Having heard counsel for the parties, though we are not inclined to interfere, we extend the time under the first direction (of approaching DIAL) issued by the High Court, till March 3, 2018," the bench said. The top court said that after the intimation is sent to DIAL, it shall decide within ten days therefrom, but restrained it from taking any decision before the expiry of one week. It said that after DIAL takes a decision on the timeline for shifting, IndiGo shall comply with the same within ten days therefrom. The budget carrier had on February 19 approached the apex court against the February 13 order of the division bench of the High Court. The larger bench of High Court had held that T-1 of the IGI Airport cannot be given exclusively to IndiGo Airlines simply because it suited a "corporate goliath" and the air carrier cannot claim monopoly over this aviation hub. The court had turned down the suggestion of IndiGo that T-1 be dedicated exclusively to its use and low-cost carrier SpiceJet be asked to move its entire operations to T-2, and said this sprang from IndiGo's own commercial considerations and not made in the larger public good. It said SpiceJet was as much a business rival of IndiGo as GoAir was a competitor of these two private carriers. IndiGo may be on top of the heap if the volume of passenger traffic is seen, but this would not entitle Indigo to claim monopoly over T-1 to the exclusion of the rest, it added. Low cost carrier IndiGo on Saturday said it accepts the Supreme Court's decision regarding partial shifting of operations to Terminal 2 of IGI airport here and would implement the order in the coming weeks. The apex court on Friday rejected the airline's plea challenging a Delhi High Court order to shift one-third of its Terminal 1 operations to Terminal 2 of Indira Gandhi International Airport. However, the airline said it had maintained consistently "in all forums that shifting of only a part of its operations from Terminal 1 to Terminal 2 would not only cause grave inconvenience and confusion amongst passengers, it will also reduce flight options for passengers connecting through Delhi". "IndiGo deferentially accepts the decision of the apex court and shall implement the order in the coming weeks, in close coordination with Delhi International Airport Limited," the airline said in a statement. By virtue of the said order, IndiGo would be one of the only two airlines to operate from three different terminals of one airport, it said. IndiGo today announced expansion of its regional operations, adding seven new ATR-operated flights from next month, connecting Nagpur and Mangalore with Hyderabad and Chennai. It will operate two direct daily flights on the Hyderabad-Nagpur-Hyderabad sector, and thrice daily on the Hyderabad-Mangalore-Hyderabad sector from March 25, the airline said, adding it will also operate two direct daily flights on the Chennai-Mangalore-Chennai sector from May 1. Air Lease announced lease agreements for two IAE V2527-powered Airbus A320-200s with IndiGo, India’s largest passenger airline by market share. Both aircraft are scheduled to deliver in Q3/18. IndiGo has whittled down its choice of widebody jet to the A330neo Bloomberg news has stated. Sources familiar with developments told the news agency that talks with Airbus are currently ongoing for an order of up to fifty A330neo including options. Other offerings considered included the A350 as well as the B787 from Boeing. However, the A330neo was deemed the preferred option given faster delivery times and flightdeck commonality with the A320. An order announcement could come as early as June, one of the people said. The decision comes hours after an A320 neo aircraft of IndiGo flight to Lucknow suffered mid-air engine failure forcing it to make an emergency landing at Ahmedabad airport. The Airbus A320 Neo plane had 186 passengers on board. ''Both IndiGo and GoAir have been told not to refit these engines, which are spare with them in their inventory,'' the Directorate General of Civil Aviation (DGCA) said in a statement. The regulator said it would be in touch with the stakeholders and review the situation in due course and when the issue is addressed by European regulator EASA and P&W. Indian low-cost carrier IndiGo from 25MAR18 is introducing additional international route to Oman, which sees the airline schedules Thiruvananthapuram – Muscat route. Based on GDS listing, service currently scheduled from 25MAR18 to 14JUN18. Airbus A320 operates this route once a day. ^^ This is in lieu of CCJ-MCT during the same time. Not sure what is keeping 6E from starting TRV-MCT, ie, whether it is an issue with bilaterals getting maxed out? Indigo has added a new ATR72-600 to the fleet today, as VT-IYE. IndiGo Airline's brand new ATR plane, which was flying from France's Toulouse to India on Thursday, returned to its base an hour after taking off. The flight returned to its base due to low oil pressure in one of its engines for maintenance check. "Within an hour into flight, engine low pressure was detected in one of the engines of IndiGo ATR 72-600. The aircraft was being ferried (non revenue flight/no revenue passengers onboard), from Toulouse (France) to India." read an official note. "As a precautionary measure the aircraft immediately returned to Toulouse for maintenance checks. Post maintenance the aircraft was released for ferry. The matter has been brought to the notice of the regulator," it added. After lots of dilly- dallying and court battles, the largest airline IndiGo has agrreed to relocate a chunk of its operations to the revamped terminal 2 of the Indira Gandhi airport in the national Capital from March 25. Another budget carrier SpiceJet too had announced yesterday that it would move 22 of its flights to seven destinations from March 25 to the T2. GoAir had already moved its entire operations to T2 last October. The IndiGo decision comes after the Supreme Court had last month dismissed its petition against the airport operator GMR Group which had asked these low-cost carriers to partially move to the T2 which has been revamped at a cost of Rs 100 crore. As part of the move, IndiGo will operate as many as 10 sectors--Amritsar, Bagdogra, Bengaluru, Bhubaneshwar, Chennai, Raipur, Srinagar, Udaipur, Vadodara and Vishakhapatnam--with 6E2000-6E 2999 flight numbers, Delhi International Airport said in a statement today. SpiceJet will relocate seven sectors--Ahmedabad, Cochin, Goa, Gorakhpur, Patna, Pune and Surat--to the new terminal with SG 8000 to SG 8999 flight numbers, it said. The shifting of partial services to the new terminal, which has been refurbished at a cost of Rs 100 crore, from the existing terminal T1 will pave the way for expansion work at T1, the airport operator said. There are three operational terminals--T1, T2 and T3. While IndiGo and SpiceJet operate their domestic services from T1, GoAir flies from T2. Seems super annoying for customers to have split operations between terminals that are so far away. Indigo has added a new ATR72-600 to the fleet today, as VT-IYF. After Air Asia’s plan to commence flight services between Indore and Surat by April end, Indigo Airlines is planning to launch services to destinations like Guwahati, Hyderabad, Mumbai, Ahmedabad and Delhi by end of May or early June. Sources said Indigo authorities are yet to decide on the probable sectors to be included in Surat’s fly list, but they plan to operate three ATRs and an Airbus. The airline authorities had visited the airport for the time slots and they are likely to seek permission of the directorate general of civil aviation (DGCA) for launching services from Surat. Indigo has added a pre-owned A320 to the fleet today, as VT-IHQ. Not sure if Terminal 2 in DEL can handle all of Indigo's operations in addition to GoAir. 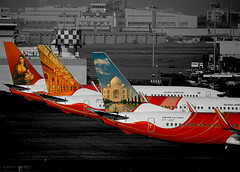 VT-IHQ is none other than a former Kingfisher aircraft. Fourteen Airbus A320neo planes operated by IndiGo and GoAir that were grounded in the past two months because of engine glitches, are now operational and have been inducted into the airline fleet. The Airbus A320neo aircraft are fitted with Pratt & Whitney engines. A P&W India spokesperson confirmed the development, adding that the engines that were grounded earlier due to “knife-edge seal” issue are now operational. The country’s largest domestic airline, IndiGo (InterGlobe Aviation Ltd), had cancelled several flights, while rescheduling others after eight of its Airbus A320neo aircraft were grounded in March following the directives from the country’s aviation regulator, Directorate General of Civil Aviation (DGCA). IndiGo had in February grounded three P&W engine-powered A320neo aircraft due to glitches in both engines. An IndiGo spokesperson said 11 of its Airbus A320neo aircraft, earlier grounded due to Pratt and Whitney engine glitches, are now operational. Wadia Group-owned GoAir’s three similar aircraft, grounded last month due to “knife-edge seal” issue, are now operational, a spokesperson of the airline said. Operations at both airlines were disrupted due to aircraft groundings in February and March respectively, ahead of the peak travelling season that started in April, when schools and colleges in India shut for summer break, and people head out for holidays. Well, seems like IndiGo have shown Mr. Ghosh the door! The engine troubles hit budget carrier IndiGo again with the airline forced to ground two of its Airbus A320 Neo planes due to technical glitches, according to a source. The two Pratt & Whitney engine-powered A320 Neo planes were taken out of operations on Friday, the source said. IndiGo, which had to ground 11 A320 Neos between February and March this year due to safety concerns, confirmed that it had pulled out two of its planes from the service. The airline further said the two planes are back into operations now. The airline had earlier this month said all its aircraft, which had been taken out of service following directives of the European aviation safety regulator Easa and India's Directorate General of Civil Aviation, were back into flying after the change of engines by the US engine supplier Pratt & Whitney. “IndiGo was forced to ground two A320 Neo planes on Friday due to engine glitches. While one aircraft was grounded at Ranchi due to oil leakage, the other one was taken out of service at the Dibrugarh airport as its fire warning system had stopped functioning,” the source said. When contacted, an IndiGo spokesperson said while one A320 Neo was grounded due to a false warning in the cockpit, another one was taken out of service due to a minor oil leak. Both the aircraft are back into flying now, the spokesperson said, adding that the grounding of these planes did not take place on account of known ‘PW’ issues but due to day-to-day issues of “operational nature”. Indigo has added a pre-owned A320 to the fleet today, as VT-IHR. Indigo has added a new ATR72-600 to the fleet today, as VT-IYG. IndiGo has decided to have electronic swatters on its planes to control the growing menace of mosquitoes on board. The swatters (the battery-operated, racquet-shaped mosquito ‘bats’ used at home) will be on the flights from this month onwards. Each plane will have two swatters, which the cabin crew will use under a defined process, excluding usage during plane refuelling. The batteries will be changed at the stations. "There have been a number of passenger complaints. Our flights also get delayed. So, we have decided to use these [swatters]," said an airline official who did not want to be named. An IndiGo spokesperson confirmed the move. “The electronic bats [swatters] will be used only in exceptional circumstances and not as a regular practice,” she said. Preventive measures such as spraying approved insecticides before departure and placing mosquito repellent patches in the aircraft are already taken, she added.